This thesis presents research into the possibilities for climate adaptation in Dutch urban areas. We want to know how cities can best prepare for extreme rainfall, droughts, and heat waves in future climates. These events are likely to become more frequent and more extreme. 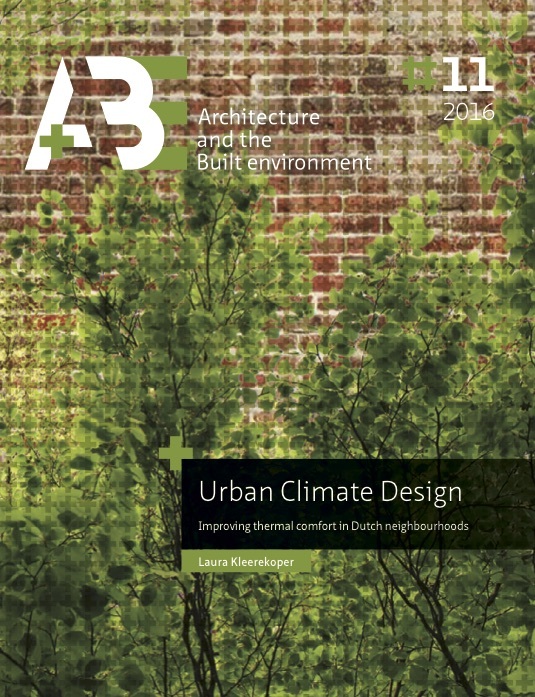 The focus is on heat resistance as this has been a neglected concept in Dutch urban planning. The aim of this study is to extend our knowledge of the effects of climate-adaptation measures and to stimulate the implementation of such measures in the design of public space. Anticipating on the effects of climate change, the research was guided by the question: Which urban design principles can be applied in specific Dutch neighbourhoods to respond to the effects of climate change, especially in terms of outdoor thermal comfort and water management? In the evaluation of measures for climate robust urban areas it is important to gauge the extent of the effects of such measures. These effects are generally expressed in terms of air temperature. However, the comparison of results of measures from various studies is not a simple matter: there are significant differences in spatial, climatological and methodological variations adopted in these studies. Bringing results together from very specific studies may give an impression of the potential of certain measures. For example, most studies support the idea that greening has the highest effect on thermal comfort as it provides both shade and active cooling due to ‘evapotranspiration’1. Nevertheless, vegetation can also retain heat, as we can feel after sundown. Other measures that were investigated for their effects are water, urban morphology, materials and colour. Contextual aspects and combinations of measures can seriously influence the effects of measures. To get a grip on such effects and their co-occurrence (interrelations), possible adaptations to an existing rural configuration were modelled and their effects on the microclimate were simulated using the numerical program ENVI-met. It is demonstrated that, for instance, trees combined with highly reflective façades do often not provide cooling, whereas trees combined with moderate façade colouring does. To assess the effects of a single measure, independent of its context, single parameter simulations of thermal comfort (PET) were performed. This is the first time that such a comparative study was undertaken in The Netherlands. The complexity of the situations was increased gradually from an empty field with only pavement or only grass, to pavement with grass and a single building, moving up to a building with a few trees to many trees, multiple buildings and built forms. During this study it became clear that airflow has a significant influence on the comfort temperature. However, cooling by means of creating drafts on a mesoscale is difficult to manage and control. The low wind speed, which is typical for Dutch heat waves, provides ventilation through thermal stratification. Airflow between warm and cool spaces only occurs with sufficient temperature differences and low wind speed. This principle was investigated on the side towards new measures because little is known about the effects of generating airflow as a result of façade colour. Measurements were performed first in a small-scale experiment in a controlled area and when results seemed promising this was extended to a full-scale situation on an average Summer’s day. In current practice, urban design pays little or no attention to the urban microclimate and urban-heat stress. Designers indicate that they have insufficient knowledge and evaluation instruments. The design study discussed in the third part of this thesis provides examples of climate adaptive applications and suggestions for design strategies. Design solutions were applied to reveal spatial implications for most of the neighbourhoods in the analysis and serve as examples and a source of inspiration. Promising and neighbourhood-specific measures were selected per neighbourhood type to support the design process. To demonstrate how microclimates can be managed with design choices, a design case was developed in more detail for three cities. Prioritizing measures at the design stage depends on many external and intrinsic factors. The three designs in this thesis follow the same path: analysis > maximisation > optimisation > integration. When maximization focuses on thermal comfort only design measures concerning this aspect are applied. Prioritization can be applied in a three-step strategy of: warming prevention, passive cooling and active cooling. The design process is an iterative process in which promising combinations may be found in the optimization and this may require additional analysis. A categorized set of measures to be able to select the right measure for the right neighbourhood typology. The study is part of a consortium of complementary research projects and stakeholders with the aim to generate knowledge through research as input for councils and other stakeholders. In addition, three participating municipal councils have gained further insight into cases that were proposed by them.